The home grown brand Crystal Jade has unveiled its latest outlet at Marina Bay Financial Centre, Ground Plaza. Crystal Jade Prestige is the first in the central business district, is an ideal venue for hosting business luncheons for VIP guests or gathering with friends and family. Dinner at the newest restaurant started with the Deep Fried Scallop with Salted Egg Yolk ($20). 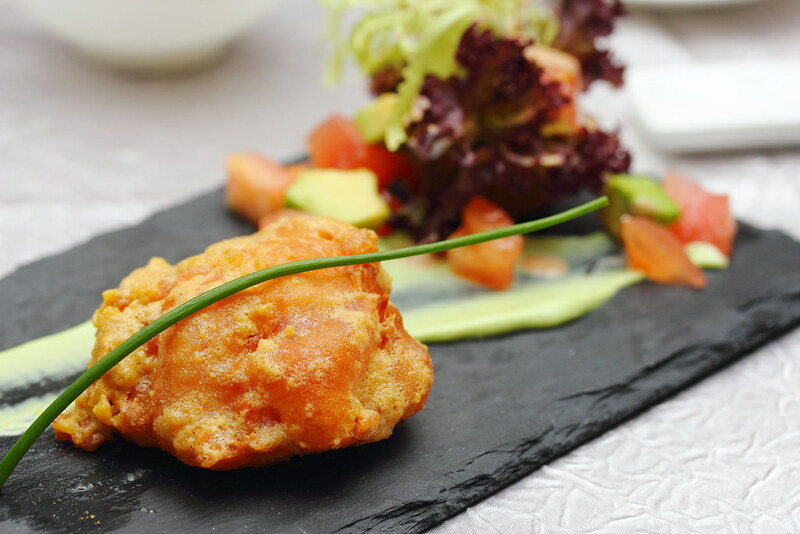 The plump scallop encased by the crispy batter is delicately paired with the avocado sauce and chilled tomato. 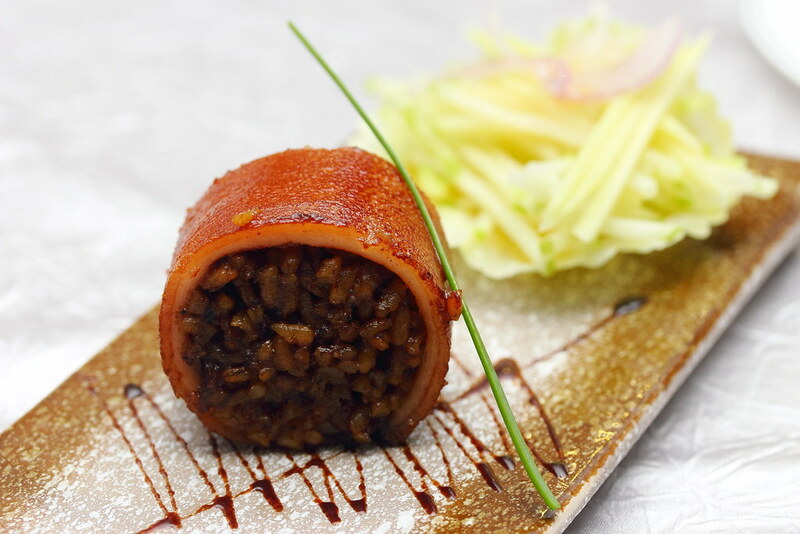 I would strong recommend you to try the Roasted Baby Suckling Pig Rolled with Black Truffle Pearl Rice ($20/pc, $168/half pig, $328/whole pig). I am sure this will impressed your guest too. Much affect and skill are needed to carve the crackling skin from the suckling pig and rolled with Japanese short grain pearl rice infused with aromatic truffle and abalone sauce. It is best to call early to reserve it as limited availability each day. 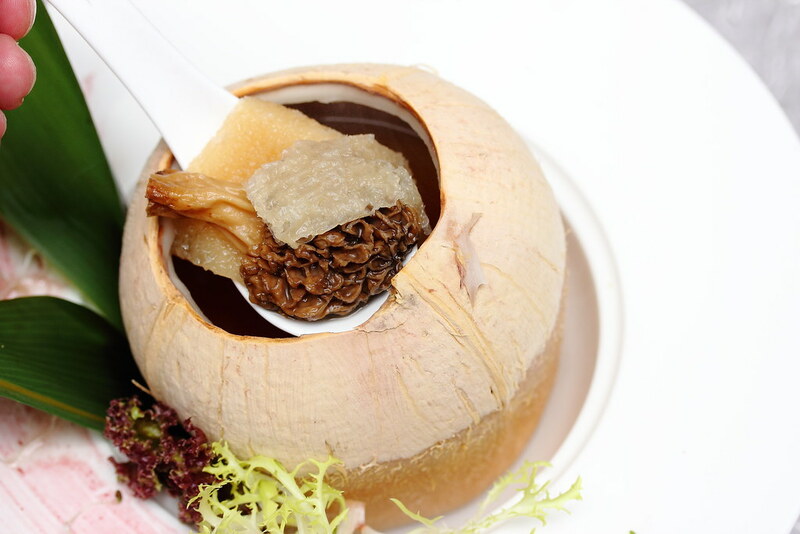 The Double Boiled Morel Mushroom & Bamboo Pith Soup ($18) is another impressive dish. Doubled boiled with the sweet coconut juice, it emits a fragrant coconut scent and well infused the fruity flavour with the essences of the premium ingredients. Whats more, the flesh of the coconut can be eaten too. 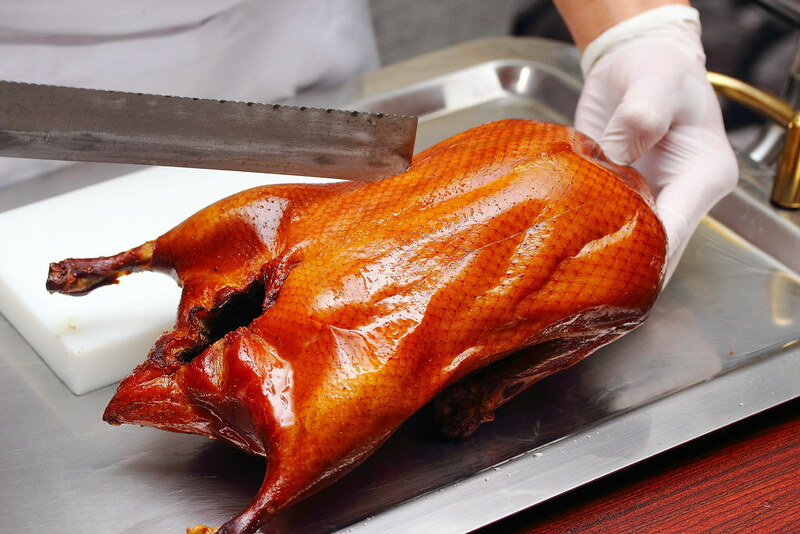 The Tea Smoked Roasted Duck ($78/duck) is one of the signature at Crystal Jade Prestige. Taking a good 30 hours of meticulous preparation involving marination, roasting, basting and smoking. 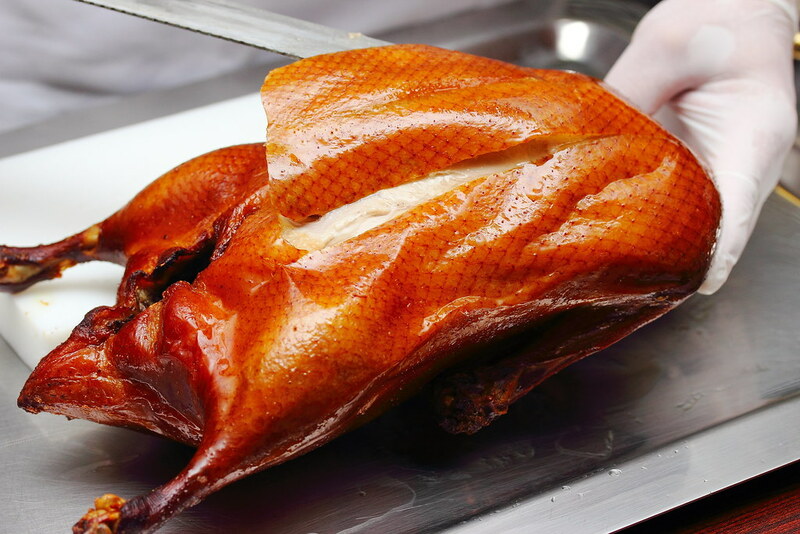 The golden tanned duck when presented at table side, filled the room with the smoky fragrance. 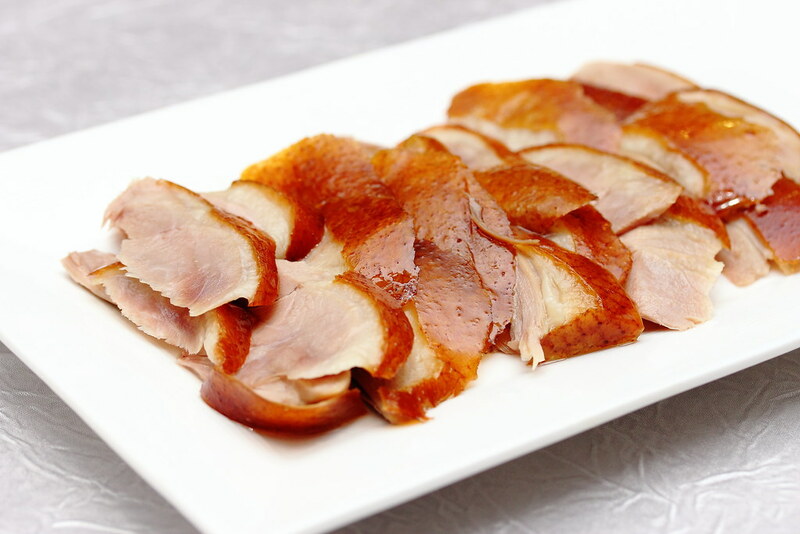 The Tea Smoked Duck is carved at table side into three various parts - the crispy skin, thigh meat and breast meat. 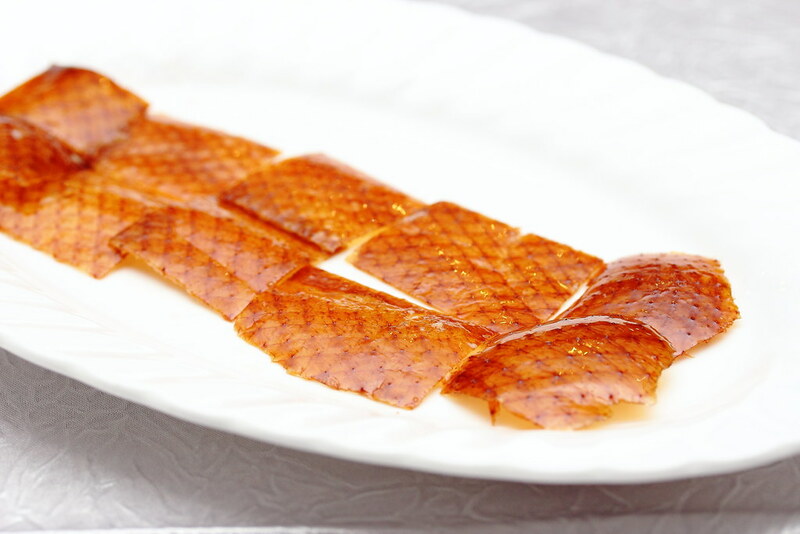 The crispy skin is best enjoy by dipping it with sugar. 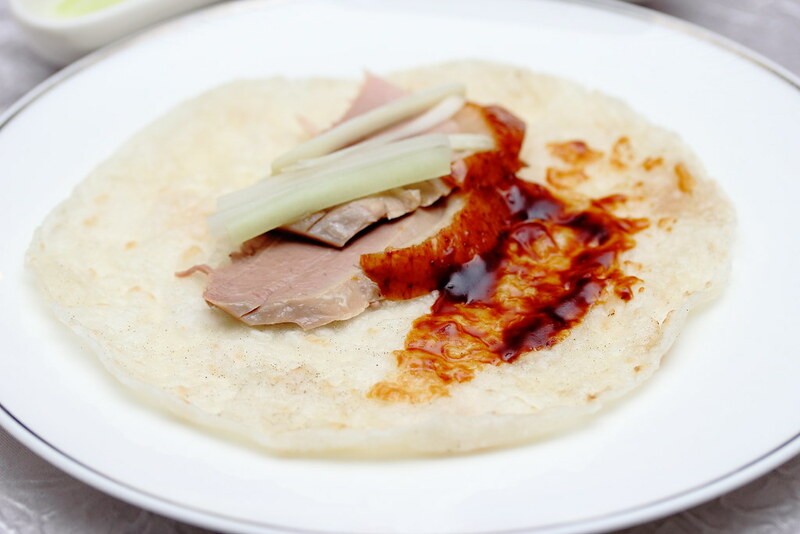 For the thigh and breast meat, it is enjoy in the traditional way of wrapping it with soft crepe, pair with cucumber, scallion and a savoury sauce. Another note worthy dish is the Pan Fried Beancurd with Black Truffle Sauce ($8.80). 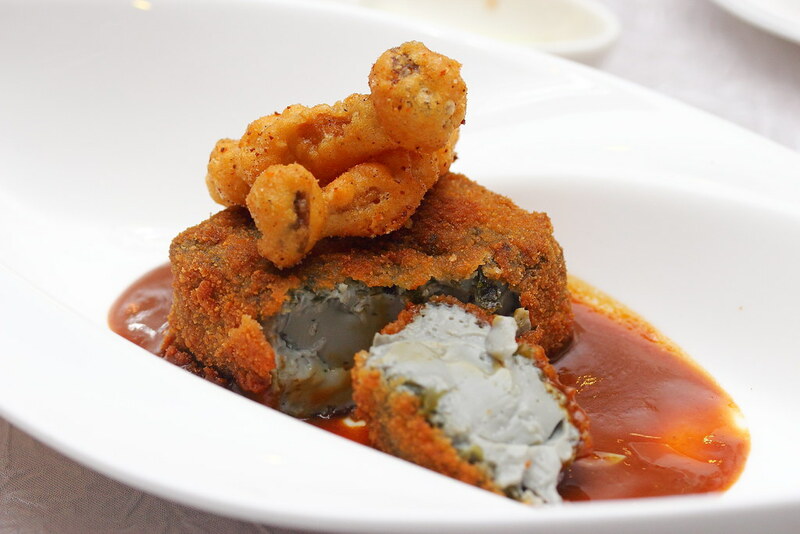 The silky soft beancurd is infused with squid ink. Kombu is wrapped around the beancurd and deep fried to crispy for a contrasting layers of enjoyment. For Chinese dinner, we usually like to end with a rice or noodle dish. 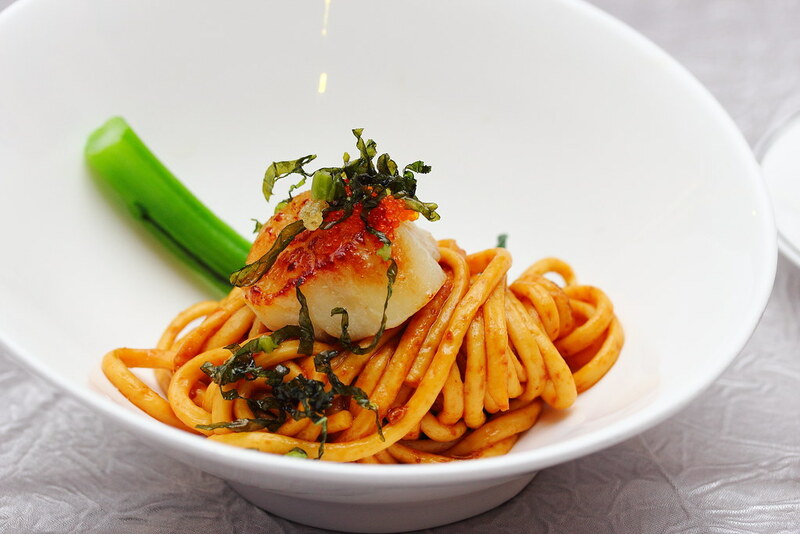 For something same but yet not the same is Pan Fried Minced Fish Noodle with Scallop ($12). The noodle made using fish paste is flavourful and comes with a delectable firm bite. Wrapping up the dinner on a sweet note, I gone for the Deep Fried Durian Ice Cream with Mango Puree ($8.50). 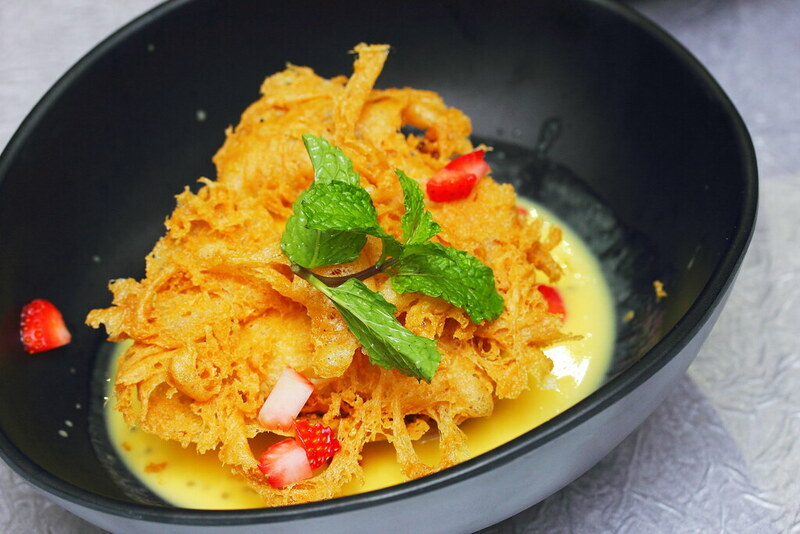 I thought that the dessert is very worth it with it serving portion and you get to enjoy two different dessert in one dish, the durian ice cream and mango puree.